This B&H Kit combines the Allen & Heath SQ-5 48-Channel / 36-Bus Digital Mixer with 16+1 Motorized Faders with six Allen & Heath ME-500 16-Channel Personal Monitor Mixers and six sets of universal in-ear monitors to create a professional mixing and monitoring platform well suited for live sound and studio applications. The Allen & Heath SQ-5 is a 48-channel, 36-bus digital mixing console well suited for live sound, corporate A/V, recording studios, and houses of worship. 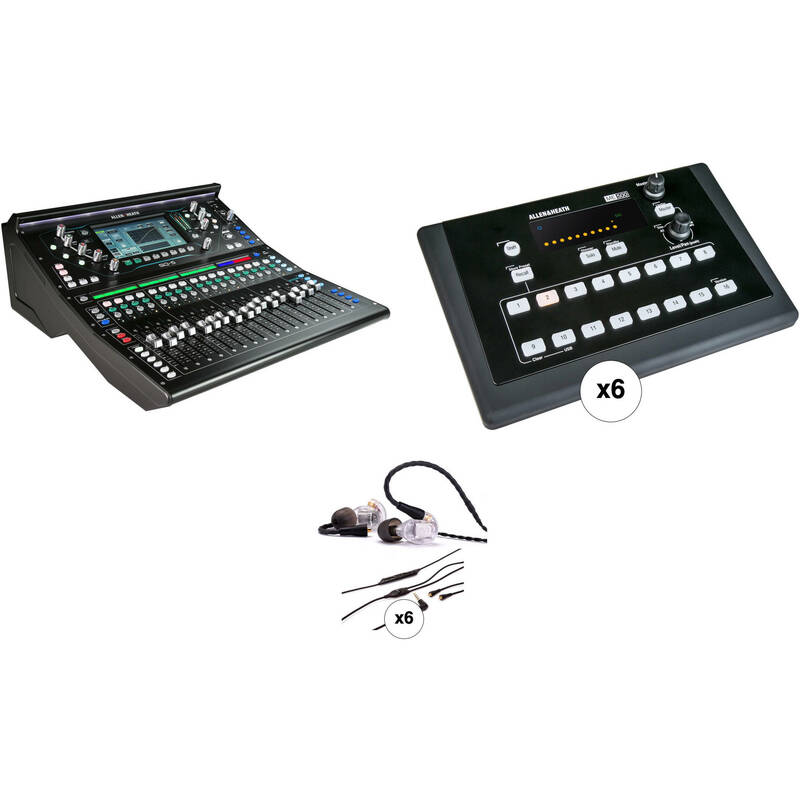 The SQ-5 features 16+1 motorized faders and 16 professional-quality microphone preamps. There are also eight stereo FX engines with dedicated return channels and access to the RackExtra FX library. The mixer's 12 stereo outputs (configurable as groups or auxes) are well suited for in-ear-monitor setups, while the Auto Mic Mixing function offers quick and easy operation over multiple microphones for conferences, panel talks, and more. At the heart of the SQ-5 lies the 96 kHz XCVI Core FPGA engine, which delivers professional, high-resolution audio quality, ultra-low latency (less than 0.7 ms), variable bit depth for precision and noise performance, mix coherency down to the sample, and the power to handle high channel / mix counts and ample FX processing. The SQ's DEEP processing architecture allows you to hand-pick boutique compressor and preamp emulations and embed them directly within the mixer's inputs and mix channels, all without adding system latency or setup hassles. The front panel is centered around the mixer's 7" capacitive touchscreen and framed by an array of high-grip, illuminated encoders, which offer clear visual feedback and quick, hands-on control. You can drag-and-drop channels and mixes to any strip with custom naming and color coding on the strip display, allowing you to build a mix environment that mirrors your workflow. The SQ-5 offers softkeys, which can be freely assigned to any function for a customized and advanced workflow. The on-board recorder uses a USB Type-A port to record stereo and multitrack sessions to a flash drive. The recorder can also playback stereo and multitrack files, making it well suited for virtual sound checks and studio mixing. The SQ-5 offers expansion options via Allen & Heath's stage box expanders, or install an optional Dante or Waves card to adapt and expand using the latest digital technologies. SQ is fully compatible with the ME Personal Mixing System, allowing performers to take control of their own monitor mixes. Any number of ME-1 and ME-500 personal mixers can be daisy-chained from the mixer's SLink port, or from a connected remote expander. The Allen & Heath SQ-5 ships with a power cord. The Allen & Heath ME-500 is a standalone digital personal mixer that receives up to 16 mono or stereo sources over a single Cat5 cable and offers a flexible and easy-to-operate solution for individual musicians, performers, and presenters who wish to control their own monitor sound whether on stage, in houses of worship, rehearsal rooms, studios, conferences, or live events. ME is a 48 kHz system compatible with most Allen & Heath mixers including the dLive, GLD, and Qu systems, as well as Aviom A-Net 16. Additionally, the unit will work with other devices with MADI, Dante, and EtherSound connectors via the optional ME-U hub. Mute or solo individual channels, adjust the tone using the on-board 2-band EQ, and set the limiter to prevent loud peaks. Once a mix has been created, simply save the set for recall at a later date. A USB port on the rear of the interface provides transfer settings and firmware updates via USB key. The Allen & Heath ME-500 ships with a power supply. The clear first-generation version of the Westone UM Pro20 Dual-Driver Universal In-Ear Monitors are designed for personal listening and professional stage monitoring applications. The monitors utilize dual balanced armature drivers in a passive crossover network to deliver a frequency response of 20 to 18,000 Hz at a sensitivity of 119 dB SPL at 1mW into a 27 ohms load. The included sound isolating star and true-fit tips provide a passive noise attenuation of 25 dB and the replaceable 50" EPIC cable is designed to fit over your ears to help reduce microphonics and secure the earphones in place. They come with premium comfort tips, a mini-monitor vault, and a cleaning tool. The earphones are handcrafted in Colorado Springs by Westone's team of artisans and lab technicians. Box Dimensions (LxWxH) 27.0 x 24.0 x 14.5"
Box Dimensions (LxWxH) 13.4 x 11.3 x 6.5"
Box Dimensions (LxWxH) 8.0 x 5.0 x 2.5"